Paper labels are available in several different design configurations and in three sizes – full-sheet, A-5 (half) sheet and one-third sheet. Though paper labels are usually only used with shielded ID bands, in some cases they may be used in combination with tyvek bands for short-stay patients. Colors blue and yellow are also available. 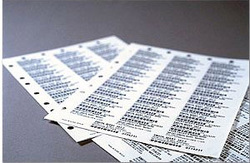 Paper Labels can also be used as asset tags with printed barcodes on them. These can then be affixed to supplies and instruments in the hospital or medical clinic to provide positive identification and tracking. 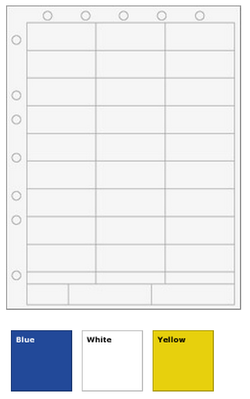 This can help in the process of checking hospital inventory supply. During patient administration, single sheet printing provides hospitals with an easy one-step label and wristband solution that can save time and money. 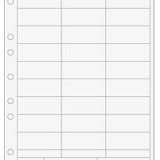 Paper Label Sheets and Bands on a Sheet (BOAS) are the most widely used labels because of their low cost and ability to print using a variety of printers, systems and materials. Laser printers are the best for printing documents, forms, and a large variety of sheet-fed hospital labels. Printing paper labels should be handled quickly and safely without disrupting other hospital procedures. Hospital staff should know how to use adjustable printer settings, allowing them to control the quality of a crisp-clean print for reliable barcode scanning. With a wider choice of label materials, sizes, shapes, shields, and adhesives, your hospital labels can be easily suited to your particular needs, your printer's applications, and hospital system and regulations. Here at EasyID we offer Hospitals and Medical Facilities several solutions to label printing that will improve time, quality and cost. Patient Administration and main nursing stations are often the most common location where laser printers can be found. Multiple hospital documents, paper labels, and wristbands can be printed in a low-cost, one-step process. The right printer and label will help ensure continuous operation and protect patients. While dedicated printers with specific labels offer great solutions to hospitals that are looking to increase efficiency. EasyID's hospital labeling and patient identification solutions are easy to use and scan. Let us help you design, print and apply your labels in minutes. From laser to portable printers, EasyID has a solution to meet your application. EasyID's hospital labeling and patient identification solution is compatible with most ADT systems and printers. We will help you find the right solution for your hospital. For more information - check out our Label page.